I was raised an evangelical christian and lived the evangelical life for almost forty years. I’m an AWANA citation winner and bible college graduate, so I know my Bible. I’m moral and my failings aren’t publicly visible. I didn’t even drink until my mid-thirties. I went on missions trips all over the world, even learning Romanian in the process. I always voted Republican. In short, I was exactly what Evangelical Christianity was supposed to produce. But for as long as I can remember, there was always something frustrating about the whole thing. I went with a friend to a Pentecostal church in high school and wondered if maybe I wasn’t being loud and crazy enough. I dabbled in reformation theology and wondered if maybe I wasn’t actually “elect”. I kind of gave up for a while but decided the godless life wasn’t much better. My fellow Christians disappointed me in their shallowness. The church disappointed me in its divisions, God disappointed me by never being as good as he could be. Finally I disappointed myself because in my heart I knew I was not someone who actually knew God. Eventually I came to realize a disparity between what we said at church and how our lives actually played out. We denied that God was actually present in the bread and wine of communion, but we invented all sorts of other rituals in which he would become present: worship services with moving music, fellowship groups, service projects, etc. We insisted on Sola Scriptura and believed whole-heartedly that the Holy Spirit would guide us into all Truth. But I had never once been in any Bible study where more than one or two people agreed about anything. I could go on, but this is supposed to be about Orthodoxy, so I shall continue. In my twenties I’d come face to face with Orthodoxy when, while in Romania, a bunch of old women chased my missions team out of the VBS room by swinging their handbags like clubs. I didn’t know what they were saying, but they very obviously did not like what we were teaching the orphans. I went home and started reading about Orthodoxy, starting with Kallistos Ware’s book The Orthodox Way. What I read in that book about the Orthodox view of God and salvation spoke to me in a way that no theology had ever spoken to me before. What I heard matched what I knew in my heart to be true. That God is Love and there are no exceptions (i.e. “God is Love, but he is also Just”). That salvation is the redemption of the whole person, not just a bureaucratic loophole guaranteeing a free ticket into Heaven. That because of the Incarnation, we can be united with God Himself, not just hiding behind Jesus’ back, shielded from the Father’s wrath. Like I said, that was in my twenties and it took another twenty years of trying to fit Orthodox thought into Evangelical Protestantism for me to finally give up and convert. I was That Guy at the Bible study. The one that always argued with everything we were being taught. Trying to make others see there was a different way of interpreting scripture, a deeper, fuller and richer view of God and salvation. 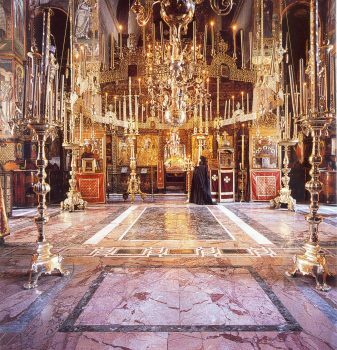 I was held up by the “weirder” parts of Orthodoxy: icon veneration, ritualistic liturgy, so much gold filigree. But eventually I came to the point where I was tired of being my own source of knowledge about God. I was tired of worshiping with others who more and more didn’t seem to be worshiping a god as good as my own. I realized I just needed to submit to the revelation of God about himself. And I saw that the Orthodox church about been teaching that same revelation since Jesus himself taught it to his disciples. They hadn’t invented stuff up along the way and I shouldn’t either. So I submitted and converted, trusting that those hangups I still had would resolve themselves as I became more Orthodox. And they have, for the most part. I haven’t necessarily become a “better” person since my conversion. But that’s not the point of Christianity anyway. Instead Orthodoxy has given me a path to salvation–Real Salvation, unification with God. It has begun to teach me humility. It has shown me the purpose of my shame and suffering. It has not been easy or comfortable, but it is Real in a way my faith never was before. But I have to be honest. There’s still too much gold filigree.